One package contains 1/4 oz. 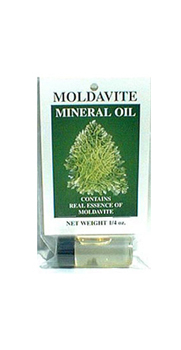 moldavite oil. This special blend of all natural ingredients contains the essence of moldavite. It was created specially to complement moldavite energies. Try wearing while meditating or when activating and advanced dream state. Can also be used to care for your moldavite by rubbing 1-2 drops of oil on the surface with a soft brush. For best results, let the oil sit in direct sun for 30 minutes. Ingredients: Dipropylene Glycol, Essential oils, Resins, Fragrance Oils, Color & Moldavite.